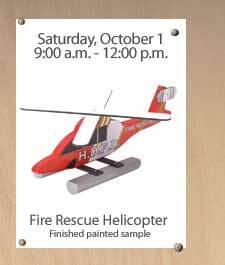 Stop by your local Home Depot with your kids this Saturday, October 1st between 9 AM and 12:00 PM for the FREE Kids Workshop where kids can make a Fire Rescue Helicopter! Kids also receive an orange Home Depot apron as well as a pin and certificate for completing their project. My kids look forward to attending these every month – we make it a fun family morning out.